My skin got a little darker coming from the beach so I’m making the most out of it! I know, I know, it’s not a HUGE difference. But when you’re like me who rarely get a tan, you’d be happy with even the slightest sign of change in your skin color. You’d go, “Oh is that a faint tan line I see? YES! I GOT DARK. JACKPOT!” So when I noticed the change, I got my neon top out and wore it with much pride before my faint tan disappears. I’ve always thought neon clothes look better on tan-skinned women. And after wearing this outfit, I stand by my statement. 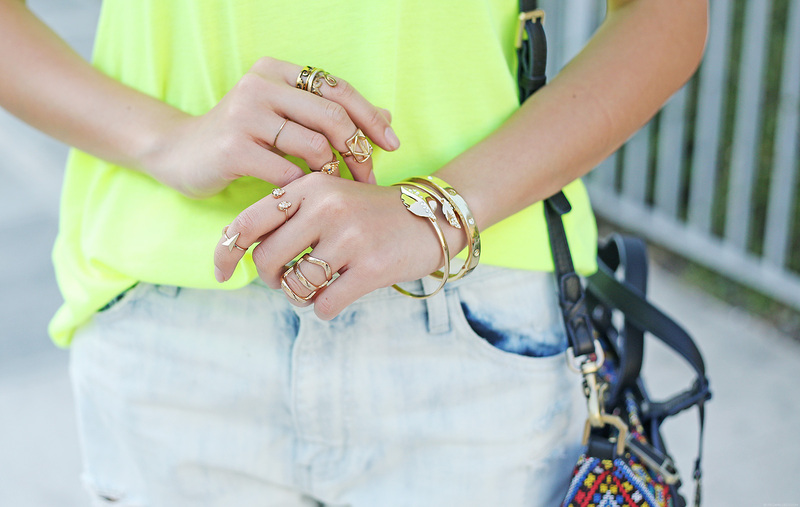 No wonder neon is all the rage every time summer comes around! This one that I’m wearing is definitely designed for summer. Check out the peek-a-boo knot design at the back! It’s perfect for our hot weather now. I’ll probably bring this to my next beach trip and wear the back as the front. It can be a cute cover-up when I’m in my bikini, don’t you think? I just came from the beach and here I am, already planning my next beach getaway! Oh summer, you’ve really arrived! Time to bring out my closet’s most colorful items! I even got my bag ready too! It’s from New York-based brand Rafé and I’m proud to say, it’s named after me. It’s called the Camille satchel. I’m so honoured and flattered to have such a beautiful bag named after me. I think it fits my colorful personality quite well! Hopefully, if you get the Camille satchel at Rustans or other Rafé outlets around the world, you’ll remember me! I can definitely see that you are a little tan here.. You look gorgeous whether you are fair or get a littl tan, Ms Camille.. =) And I agree that neon are always the rage when it comes to summer.. But I get a little intimidated if too much neon.. Haha.. I love the satchel as well.. It’s totally you! And that’s such a cool artwork behind you.. Crossing my finger for Rafe “Camille” Satchel Giveaway!!! hahaha! Bagay rin sayo ang tan Camille :) especially now freshly baked from Boracay hahaha! LOL! :) Who knows! :) Thanks Kay! Your shoes are very cool, love the color. Awww thank you Crewenna! :) So sweet! Yes buy Camille! :) I’m sure you’ll love it too! My mom wants to steal mine! Your tan beautifully contrasts with yellow top. 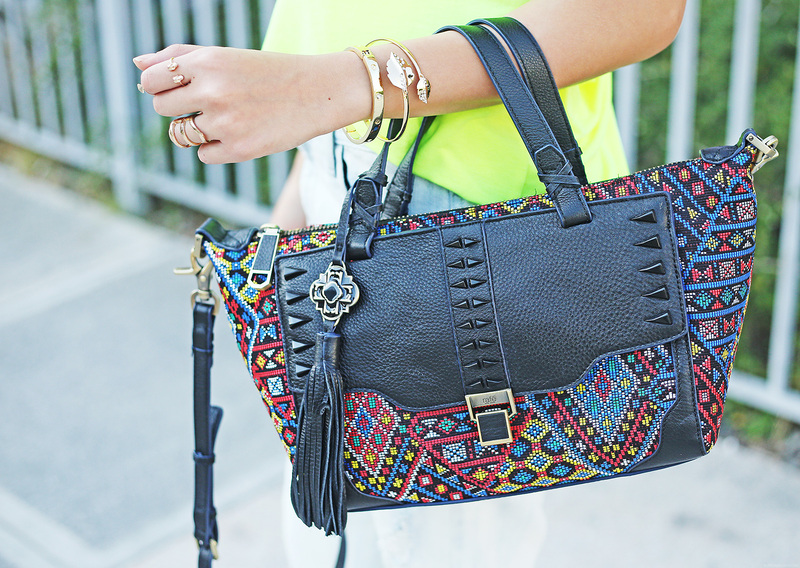 Camille satchel is perfect! Excellent outfit! I looove the details of the bag. Are those beads or a patterned fabric? Fabric :) Super love touching the texture! Haha I knoooow :( Di bale, next beach trip! I can really see that your skin got darker!! Pero grabe, even in darker skin, you still look so gorg!!! ♥ Infairness, bagay sayo maging morena haha. The bag is super cute too! Hi Ms. Camille! Love the simple detail of the tee! I’m morena and I find it hard to wear neons, is it true that it’ll make me look darker? Thank you! I really like it when morena girls wear neon! Truly! i really feel you..sometimes its just so hard to get that tan lines even if you stay long under the sun! Your dress is very special, full of fashion charm. the Camille satchel pattern is matched with wall paintings, and they are very beautiful. Appreciation! Wow! Wala akong masabi kundi wow! I’ll always checked your ig account para magoodvibes. Why your so hot? And why your so elegant whatever your dress up. Ang ganda mo po. Super idol talaga kita Miss Camille! You look so good with your tan Cams! I agree neon fits tanned skin so well. Hooray summer! The cutout peekaboo thing at the back is awesome. Perfect for our hot humid weather… and some beach trips! Just curious, where in Manila did you shoot these photos? I love the murals! Thanks Anne! Wish this tan would stay longer though! :) I shot these at Fort. BGC! Here, it’s already so so hot! This spring outfit is perfection. Love it! Love yellow and blue. This neon and cobalt are great pops together. Love the slouchy jeans too. Looks fabulous on you. Yes the neon top is indeed powerful LOL! Well as for me I easily get darker and get fine lines too when I’m under the sun even though I apply for SPF. BGC Art background in these photos right? How can you look so fabulous wearing such a simple outfit? Nakakaloka! Haha. You always have this certain elegance about you no matter what you wear. Thanks Kyle! :) I’m flattered!